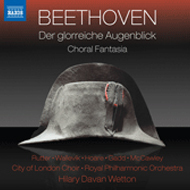 Beethoven’s unusual cantata Der glorreiche Augenblick (The Glorious Moment) is filled with patriotic praise for Vienna and tributes to the kings and princes of Europe after the defeat of Napoleon. The Choral Fantasy opens with a virtuosic, improvisatory Adagio for the piano – thrillingly rendered by Leon McCawley. The work’s main theme anticipates the famous Ode to Joy setting in Beethoven’s later Choral Symphony.